Here’s wishing you a loving holiday weekend. Whether you observe Passover, Easter, the Solstice—or simply the coming of spring—may your days be filled with joy and renewal. I had intended to get this recipe to you a bit sooner, but hopefully there’s still time to include it in your holiday menus. This Classic Vanilla Cheesecake by Melissa Clark is made in an Instant Pot. I’ll admit that I was hesitant to purchase one of these devices but I’m so glad I did—this cheesecake is a revelation. While the crust is baked in a traditional oven ahead of time, the filled cake is essentially steamed, creating a moist, rich and delicious dessert. Serve it on its own, or accompanied by seasonal fresh fruit. Note: If you don’t own an Instant Pot, this cake can be made in the oven. Instructions are included in the notes of the recipe. You’ll find suggestions for making this cake for Passover, as well. Preheat oven to 350 degrees F. To make the crust, combine crumbs, butter, brown sugar, and salt in a small bowl. Pat into the bottom of a 6-or-7-inch springform pan, patting it all over the bottom and ½ inch to 1 inch up the sides. Cover the bottom of the pan with aluminum foil. Bake until golden brown, 8 to 12 minutes. Transfer it to a rack to cool. Make the filling: Using an electric mixer fitted with the paddle attachment, beat the cream cheese and sugar until the mixture is very smooth (this could take several minutes). Then add the crème fraîche or sour cream, beating again until incorporated. Use a paring knife to scrape the seeds out of the vanilla bean so that they drop into the mixer bowl. Add the brandy and salt and beat again until smooth. Beat in the eggs, one at at im, scraping down the sides of the bowl between additions. Pour the filling into the prepared pan, and cover the top of the springform pan with aluminum foil. Using your Instant Pot®, fill the pressure cooker with ½-inch of water. You can either place a steamer rack in the pot and then lower the cake pa onto the rack using a homemade sling (see nots), or, if you have a rack with an attached handle, simply lower the rack and pan together. Cover and cook on high pressure for 32 minutes. Let the pressure release naturally for 8 minutes, and then release the remaining pressure manually. Lift the pan out of the pressure cooker and transfer it to a wire rack. Remove the foil. 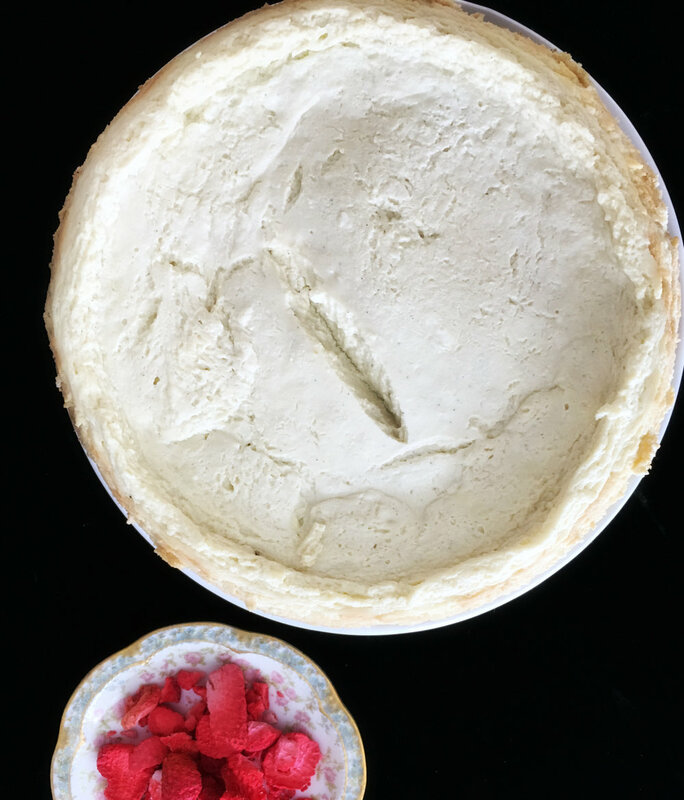 Only the outside of the cheesecake should be fully set; the inside will str further as it cools. Let the cheesecake cool to room temperature. Chill the cheesecake for at least 8 hours and preferably overnight. Release the springform sides and serve. To make a homemade sling, fold a long (about 16-inches) piece of aluminum foil into thirds so that it can sit under the pan and extend up the sides of the pressure cooker pot ( as handles). This recipe is from Dinner In An Instant by Melissa Clark. If you don’t have an Instant Pot®, you can bake this cake in a traditional oven. Follow all the steps to prep the cake. Preheat your oven to 325 degrees F. Place a pan in the oven that is deep enough to hold an inch of water and wide enough to hold the cheesecake pan. Place the cheesecake in the pan and pour an inch of hot water into the pan. Bake until almost set, about 45 minutes. Remove from oven. Remove from pan. Allow to cool completely. Wrap and refrigerate for at least 2 hours before serving but preferably overnight. To make this recipe for Passover, leave off the crust. Or, substitute crushed almonds for graham cracker crumbs. You can print this recipe here. If you make this recipe, please take a photo and post it on Instagram with the tag #gatheringflavors.